Is your landscape missing something? O’Grady’s Landscape can provide you with the artistic, functional, and long-lasting landscape architecture you need to complete the look and feel of your outdoor living spaces. We have been providing Northern Virginia homeowners with comprehensive hardscape and landscape designs since 1991, so you know you can depend on us for reliable, professional service. To discuss your landscape architecture project with our experts, fill out an online contact form or call (703) 533-5001. We serve residents in North Arlington, McLean, Vienna, Great Falls, and the City of Falls Church and look forwarding to helping you next! To begin the process, you will meet with an experienced landscape architect on our team, who will discuss your goals with you and perform a site analysis to see what’s feasible and address any issues within your property (ex., poor drainage). We strive to provide each of our clients with an end result that’s environmentally friendly, beautiful, practical, and built to last, and this begins with the initial planning stages. Your budget and maintenance requirements, along with local zoning regulations, will also impact the way we approach the design. Your landscape architecture is what sets your property apart. Technical considerations, irrigation, and the scope of your landscape are all critical components to creating a successful design—which is why it’s so important that the landscape designer you choose is experienced and detail-oriented. 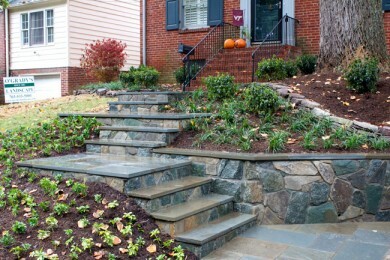 At O’Grady’s Landscape, we approach each project throughout Northern Virginia with thoughtful design and careful craftsmanship to ensure the final product meets all your needs and is as functional as it is beautiful. We want to help you build the home of your dreams, and we know how important the landscape architecture is to achieving that goal. Our team has been trusted in the area since 1991. If you’re located in Great Falls, City of Falls Church, North Arlington, Vienna, or McLean, please contact us for your FREE quote and initial consultation. We’ll get back to you in just 24 hours!